The spear phishing method used in this attack is far from being new or sophisticated. However, I am posting the following information due to the particularly invasive approach of the attack. Google, Yahoo, and other personal mail services do not offer the same protection against spoofing and malware as enterprise accounts. In addition, it is often being checked at home in a relaxed atmosphere, which helps to catch the victim off guard, especially if it appears to arrive from a frequent contact. Some people have a habit of forwarding messages from enterprise accounts to their personal mail for saving or easy reading at home, which may potentially offer some sensitive information. 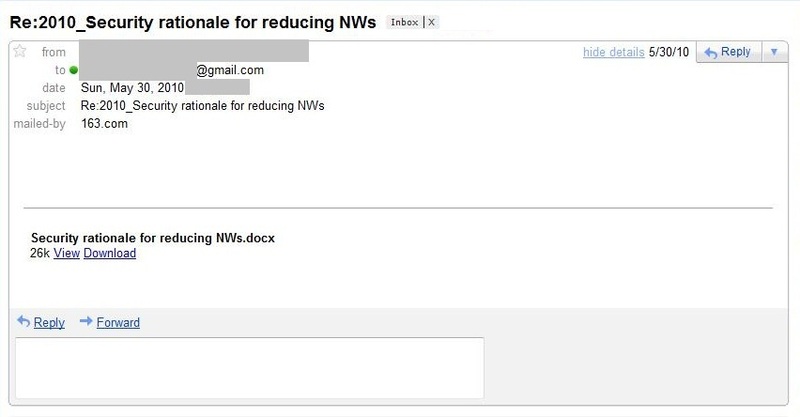 View Download link in Gmail masquerading as a link to view or download an attachment. The message comes without any attachments. 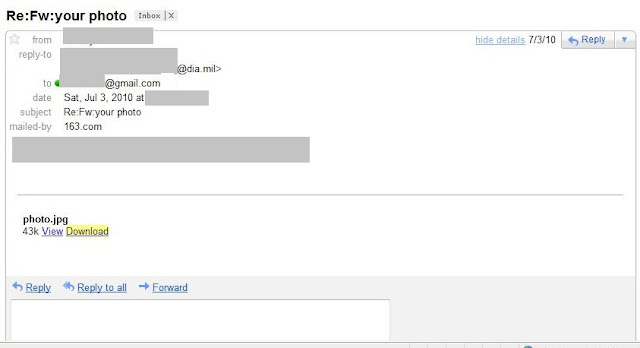 Email link, targeted phishing message sent to Gmail account of a person associated with military or political affairs. Links are customized and individualized for each target. Victims get a message from an address of a close associate or a collaborating organization/agency, which is spoofed. The message is crafted to appear like it has an attachment with links like View Download and a name of the supposed attachment. The link leads to a fake Gmail login page for harvesting credentials. Read mail and gather information about the closest associates and family/friends, especially about frequent correspondents. Use the harvested information for making future mailings more plausible. Some messages are empty while others may have references to family members and friends (e.g. mention names of spouses or refer to recent meetings) and plausible enough to generate responses or conversations from victims. We are not posting those examples due to personal nature. Send such emails on monthly or biweekly basis . The messages are different like you see below but all have have the same link and designed for updating the victim credential information they already have. There here has been a lot of speculation over the past few days on how much sensitive data a hacker can find on personal email accounts, considering it is against the rules in most places to use personal accounts for work Although there are strict rules for classified messages and documents, the intruders are often satisfied with just sensitive or just informational messages for building the picture they need. While I don't know how strict the rules are at the White House, the following behavior is common for at least some US Government offices and for many companies. This information is from my own knowledge, as well as accounts of people working for the US Government, military, as well as Fortune 500 companies, non-government research institutions, and other places. I am sure you will find none of these scenarios surprising, they all are very common. 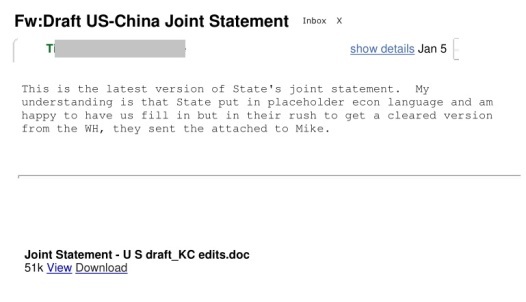 Fw:Draft US-China Joint Statement is from dorsetttr1@state.gov, which is a non-existent account and spoofed domain. Others that are edited are real but spoofed. The link in email messages is always the same like below and redirects the victim to a fake Gmail login page, the credentials get harvested before the victim gets redirected to his mailbox. 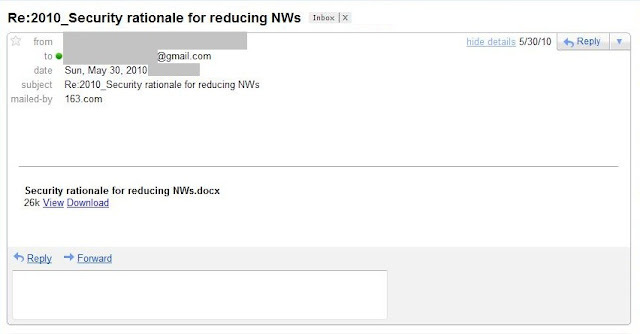 Fake Gmail HTM page retrieved from the victim's IE Temporary Internet files compared to a real page. Both are from February 2011.
sent the attached to Mike. X-OriginalArrivalTime: 06 Dec 2010 xxxxxxxxxx.0578 (UTC) FILETIME=[37C22520:01CB954A] This is a multi-part message in MIME format. ------=_NextPart_000_0136_01CB958D.45C66B70 Content-Type: text/plain; charset="UTF-8"
Submission of credentials in clear text on the fake login page and redirect to Gmail. Checks for the password length and it if is less than 6 characters, displays 'Enter your password' pop up, otherwise accepts ANY password and redirects the victim further to Google. res protocol has been disabled for Internet Zone since IE6 SP1. Do you know how to achieve the same without res and without malicious zone escalation on the client site please? It looks it is not working. Never mind. If I find a working version I will let you know. So, how do the photo attachments lead to a problem? Or is the photo not valid so it might get opened up with something that can read more than just images? This gives too much emphasis on insignificant visual clues that the attacker can easily resolve. Unless your trying to embarrass the attackers with their shoddy work. An attacker could easily create a perfect and upto date visual clone with correct page name and links. The only significant information here for end users is that the domain name is wrong and ssl is not used and they could even of done a better job of that. Perhaps using a phishing address such as goog1e.com and enabling ssl. The best advice for high profile targets, is to understand howto verify the site certificate is the correct one for google. The browsers could do more here. I'm also very found of the two stage authentication mechanism from Google, that makes this type of attacker very difficult. This is incredible information about this widely reported Gmail attack. Thank you for the very informative info! 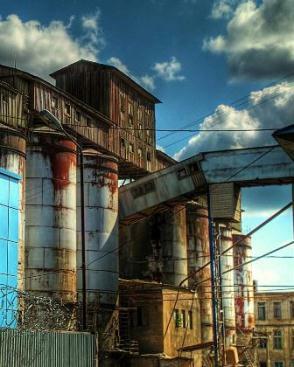 -- The visial clues are not advice and things to watch for the future but explanation for the past event. I am sure the next one will be better done and perhaps very different. I have had the very same problem with targeted attacks against my gmail account. Probably because I used to do work about free China. I mean, free internet China. thanks for taking the time to post this valuable information.